If you are constantly being challenged to source new and interesting venues to make your conference ‘extra special’, then from wacky to amazing, Yorkshire has a multitude of purposeful and motivating venues to surprise your delegates. Ampleforth Abbey & College offers a unique setting with a range of historical, traditional and listed buildings spread throughout a 2000 acre on the edge of the North Yorkshire Moors. Ampleforth has everything you can imagine or want. Today the building is a museum with a range of fascinating exhibitions and plenty of inspiring breakout spaces. Beningbrough Hall and Gardens is a friendly, relaxed and inspiring venue. Visit our famous pear arch and working walled garden which supplies the Walled Garden Restaurant. Stroll along formal borders, labyrinth paths and discover hidden woods. Set in the heart of the Yorkshire Dales, the Black Sheep Brewery is the ideal location for a day or evening out. Carlton Towers is an enchanting privately owned Victorian Gothic English stately home set amongst 250 acres of private parkland. Available throughout the year for exclusive hire for weddings, corporate dinners and parties it features luxury accommodation. Brompton Lakes is the perfect corporate retreat offering superior meeting and five star residential facilities in the beautiful setting of the Yorkshire Dales. Set in 26 acres of landscaped grounds, about two miles from the market town of Richmond, it is an ideal venue for management retreats, training workshops, off-site teambuilding and development events for up to twenty delegates. 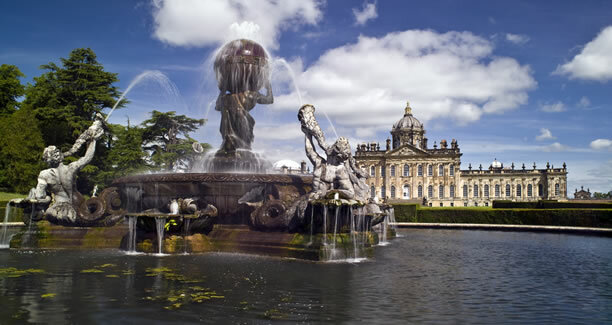 In over 1000 acres of gardens, studded with fountains and statues, Castle Howard offers an exclusive environment for inspirational away-days or training sessions. At the end of the working day, host a special reception under the dome of the Great Hall, or candlelit dinner in the Long Gallery. Denton Hall is set in 2500 acres of Yorkshire's finest countryside and only minutes away from the historic spa town of Ilkley. The hall, designed by the famous architect, John Carr, has an imposing south facing frontage and beautiful grounds - providing the perfect backdrop for conferences and events. Doncaster Racecourse and Exhibition Centre, the home of world famous horse racing for 30+ days a year including the St Leger Festival. Our onsite facilities range from a rustic log cabin ideal for smaller corporate meetings, to a large indoor barn for your away day party or perfect "English Country" style barn reception. Enjoy the location, the outdoors and the indoors, with small groups of people, come in your hundreds! If you've not come across us before, Go Ape is the UK's number one forest adventure. Days out at Go Ape are about living life more adventurously, having fun with friends and family and getting in touch with your inner Tarzan (he's in there, we promise). The splendid Georgian buildings and stunning grounds of Ackworth School are now available for use as a venue. 50 en-suite bedrooms, ample free car parking, well appointed meeting rooms all with natural daylight and modern AV equipment, free wi-fi, well stocked bar, good food and hospitality. If you are seeking a unique and stimulating venue for your event then look no further than Kelham Island Museum. Telling the story of Sheffield its industries and people, there can be no more inspiring location for you to choose. A town centre location, versatile spaces and friendly service, all ideal for creative and business meetings, workshops and regular events. Lineham Farm is a 17th century farmhouse set in 120 acres of outstanding natural beauty, based in Eccup on the outskirts of Leeds. The farm is very close to Golden Acre Park, Harewood House and Roundhay Park. Nearby towns include Otley, Ilkey, Harrogate and of course Leeds itself. Set in impressive surroundings, we have a range of meeting rooms which can accommodate meetings, conferences and training events for up to 200 delegates. What would you do with 4000m²? Magna is the former Templeborough steelworks in Rotherham, South Yorkshire. 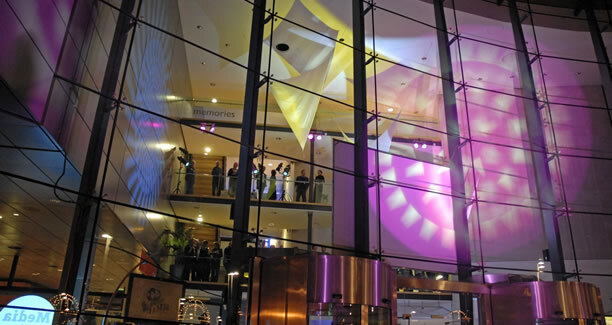 Transformed into an award-winning visitor attraction with purpose built corporate facilities that provides an awe-inspiring and breathtaking venue. Situated within 41 acres of grounds, with fantastic views. It has a fine balance of industrial heritage the Museum is known for and surrounding countryside. Set in the magnificent grade-one listed medieval church of St Margaret's York, the NCEM is available to hire for conferences, wedding receptions, special anniversary parties, musical soirées and dinners - offering a stunning backdrop for all celebrations and events. If you're looking for a event venue with a difference in then look no further. New to the Museum, is Room at the Top, a stunning suite located on the eight floor, offering fantastic cityscape views and state of the art AV. From the glory of the Flying Scotsman, to the romance of Brief Encounter, to the luxury of the Orient Express - trains have transported, inspired and entertained us. Classical 17th Century house providing an elegant and atmospheric venue, perfectly placed to cater for a dinner, drinks party, conference or activity day. If you are looking for somewhere a bit different to hold a talk, seminar or course, then look no further than the North Yorkshire Moors Railway, the UK's most popular preserved railway. Pavilions of Harrogate enjoys an enviable reputation for making every occasion special, starting from the premise that each event is unique and needs to be tailor-made to suit individual client requirements. You might think it would be more expensive to use a historic property for your event rather than a hotel but here at Ripley Castle that certainly is not the case. The Airport offers a flexible solution for all types of meetings and events with a wide range of catering available to suit your needs. The splendour of Scampston Hall near Malton, with its magnificent regency interiors and exquisite art collection, makes the perfect backdrop for your corporate event. The Spa is a multi purpose venue on the Yorkshire coast, offering excellent conference, exhibition, entertainment, and banqueting facilities. The largest UK theatre complex outside of London, Sheffield Theatres is comprised of the Crucible, Crucible Studio and Lyceum Theatres. Sheffield Theatres stage a wide range of in-house and touring productions, from new plays to classic dramas, musicals and dance. The Shibden Mill Inn combines the history and charm of a 17th Century property with the modern day requirements of the business world. A stunning venue situated in Bradford city centre, seating up to 1,428 people in an opulent traditional auditorium. The Cooking School is a state-of-the-art facility for cooking, nestled in the heart of Pennine Yorkshire. We offer the perfect venue for meetings, conferences and receptions, away-days and teambuilding, Private dining/hospitality, staff reward and incentive days and product launches. Offering a unique blend of stunning marine life, interactives and audio-visual presentations which together tell the dramatic story of the world's oceans. With 5000 m2 of space, The Hepworth Wakefield offers the newest and most dramatic venue in the region. Fully fitted with Wi-Fi and extensive audio-visual facilities the purpose-built auditorium is a modern space offering flexibility and comfort for a variety of events. Drinks and dining, weddings and bespoke events, luxury woodland villas and championship golf - all this in 180 glorious acres in the heart of the Yorkshire Wolds. The Stephen Joseph Theatre is set in a stunning 1930's listed building, with an Art Deco interior. Offering four unique spaces, the SJT is perfect for events from conferences and presentations to AGM's and small meetings, with expert staff to assist you. We can offer excellent training and meeting rooms facilities in a private location with ample parking and good road links to the major motorways. A busy theatre complex housing two auditoria, three meeting rooms, a fully licensed bar and restaurant and small art gallery. YorkBoat are delighted to offer a unique setting for your special event or conference. We have 5 modern boats, delicious menus and entertainment options available. Are you looking for a sweet treat for a conference group or the cherry on the cake for your special business event or private hire celebration? York's newest visitor attraction has it all. Comprises 5,372m2 of indoor level access event space and is set in grounds extending over 250 acres. As one of the world's leading open air art galleries, Yorkshire Sculpture Park makes a unique and ideal venue for conferencing, corporate entertaining, weddings and private parties.